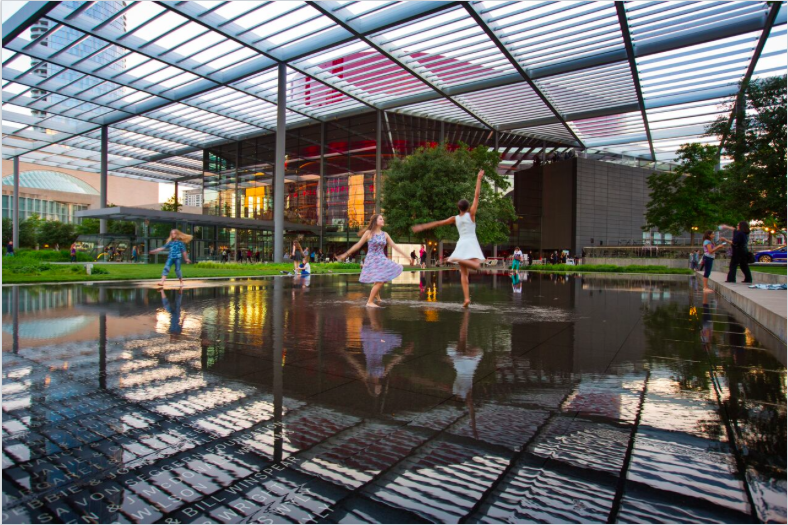 This post is the first in a series detailing a large number of math tour stops designed for the walkSTEM tours of the Dallas Arts District. 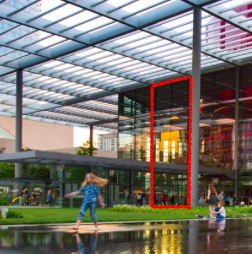 The tours begin at the Winspear Opera House, so let’s start by examining several mathematical ideas that you can bring out by examining the louvers above the plaza surrounding the opera house. A first, simple challenge that you can give is to ask tour participants how we can determine the length of the louvers above. Even if we have a tape measure here on the ground, we can’t fly up to the level of the louvers and measure them directly. There are many possible suggestions, such as guessing, using the shadows of the louvers, using ladders to get to the level of the louvers, etc. — brainstorming should be encouraged. But one very productive idea is to find something we can measure on the ground that will be the same length as the louvers. To do that, we use the mathematical properties of a basic shape: the rectangle. (Actually we are using a property that’s true of any parallelogram at all, regardless of whether it is right-angled, but rectangles are the easiest parallelograms to spot an most architectural structures.) 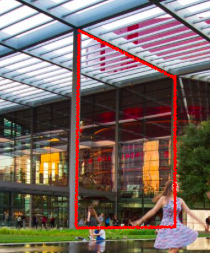 Namely, the opposite sides of a rectangle are equal in length, so if we use the rectangle shown in this annotated version of the photo at right, all we have to do is measure along the ground at the base of the building to find that the louvers are 28 feet long. The first observation here is that the numbers of louvers in the various rectangular sections or cells are not the same, as one might expect from the way most buildings are designed. That leads to a natural question — is there any pattern to the different numbers of louvers? Or any relationship between the number of louvers in adjacent cells? Well, is there any physical relationship between the louvers in one cell and the adjacent cell? A bit of observation and brainstorming will result in noticing that whenever there are more louvers in one cell than an adjacent cell, all of the “beams” from the cell with fewer louvers extend into the adjacent cell. In other words, the cell with more louvers has louvers in all of the same positions as the cell with fewer, plus some extra louvers. And where do these extra louvers go? Well, on the north side of the building, it is easy to see that one additional louver is added in every “space” created between louvers from the adjacent cell, as shown in the diagram on the left. What does this operation do to the number of louvers? It might seem as though it doubles the number of louvers, since we are adding one louver in every space, but actually it goes from three to seven louvers. Why is that? It’s because dividing a rectangle into sections with three lines creates four sections (one more section than line), and if we put one new louver in each section, we get 3 + 1×4 = 7 louvers. On the other side of the building , you can see that the architects (Foster & Partners) added two new louvers in every space between louvers of the adjacent cell, so we go from three louvers to 3 + 2×4 = 11 louvers. Following that line of cells, we see on the other side of the building that same count of eleven louvers comes from inserting one in each space among five louvers. So finding these two different ways of breaking down eleven using arithmetic operations, 3 + 2×4 = 11 = 5 + 1×6, exemplifies the kind of playing with numbers that the architects used to create this building. Measuring the width of the louvers poses similar challenges to measuring their length, but is slightly more intricate. As a first step, we can use the same technique we used to measure the length of the louvers to measure the length of the rectangular cells, but employing a different rectangle to project the length to something measurable on the ground (again shown in the annotated photo to the right). You should find that the cells are 48 feet long. However, in this case it’s not enough just to measure the length of a cell, because we’re after the width of a single louver. So the number of louvers that fit in one cell is relevant. Should we look at the cells that have the most louvers? No, because the louvers are at an angle, more louvers fit than would if they were all perfectly horizontal. So we want to estimate which cell looks as though the louvers will just fit if they were all level. We can’t be certain, but it appears as though the louvers would just touch each other when horizontal in the cells with eleven louvers. That means that the width of the louvers is the same as the spacing between the beams in the cells that have eleven louvers. How do we get that spacing? Do we divide 48 feet (the length of the cell) by 11 (the number of louvers)? No; we have to remember that the eleven beams divide the 48-foot-long cell into twelve equal spaces, so the beams are four feet apart. Hence, we estimate that the louvers are four feet wide, which seems pretty reasonable as a nice, round number. We noticed in the previous activity that the the louvers are not horizontal. Why might that be? There’s lots of possible ideas, but if we think about what the purpose of the louvers is, that may help. Namely, the louvers are there to block the sun, and so we can ask what angle is best for blocking the sun. This brings us to the idea of different problems that are mathematically equivalent; can we think of a problem that people have worked on in great detail, that maybe sounds different from blocking the most sun, but is really equivalent to that problem? Yes — the problem of mounting solar panels that soak up the most sun. It stands to reason that if a panel is absorbing the greatest amount of sunlight possible, then it must be blocking the greatest amount of sunlight possible to viewers behind the panel. So we can use the considerable amount of mathematical analysis that’s out there on optimal solar panel positioning to understand at what angle the louvers should be tilted. So should we angle the louvers at 32.8°? Well, that will block the most sun possible when the sun it at its highest point on an equinox. But will that block the most sun on average? Does the sun spend most of its time at its highest in the sky? No; it rises at the horizon and sets at the horizon each day. And because of the tilt of the earth, the sun reaches higher in the sky in the summer, but not as high in the winter. Based on all of that, it is possible to calculate a better angle to block more sunlight on average. According to the site linked above, the best year-round tilt for Dallas is 28°. 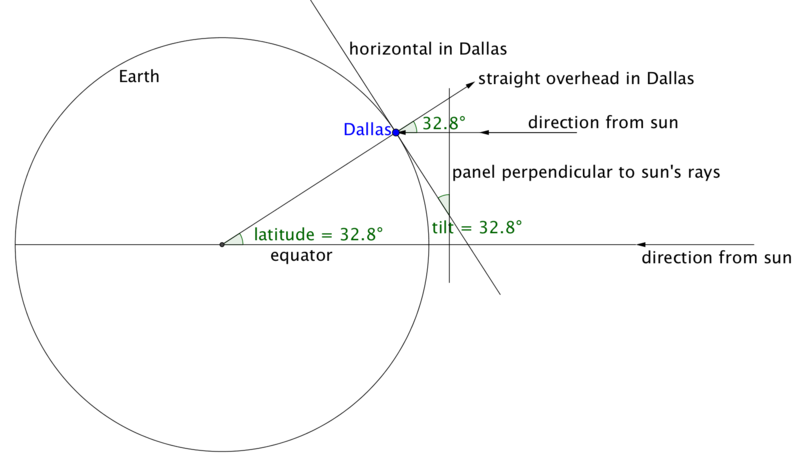 But there are always deeper layers of analysis — if you read that other site carefully, you will see that the 28° really only applies when the panels are tilted due south. Since the Winspear opera house does not happen to be oriented along lines of the compass, finding the true optimal tilt for the louvers would require further computations that we’re not going to go into here.